My guilt has taken command of me. 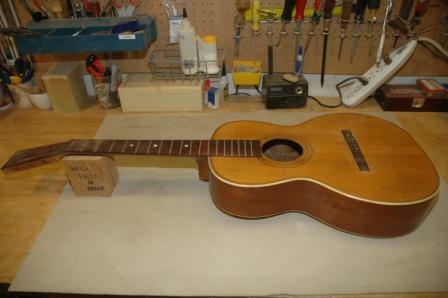 I’ve had Tom’s parlor guitar sitting waiting for me to do a neck reset since, oh I don’t know, 2008. The neck is beginning to come away from the body down at the point where the heel meets the back, essentially pulling up, depressing the top and creating massive string height. 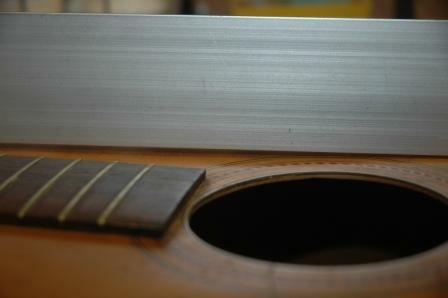 This photo shows a straightedge on the fretboard meeting the bridge at its’ base. The straight edge should hover just above the bridge surface. 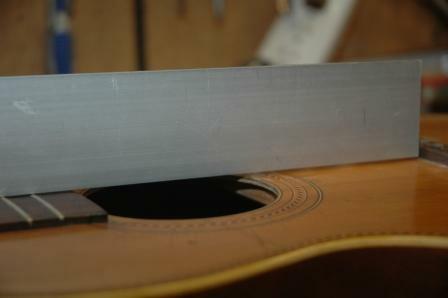 When the straightedge is placed on the lower bout area of the top, you can see the depression of the top surface around the soundhole. 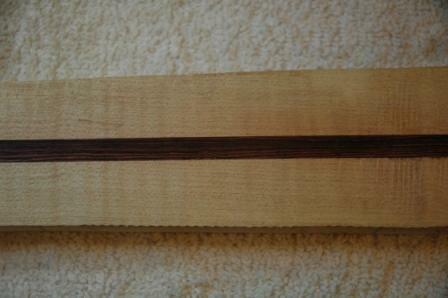 Neck removal starts with releasing the fretboard glued to the top between the heel and the soundhole. 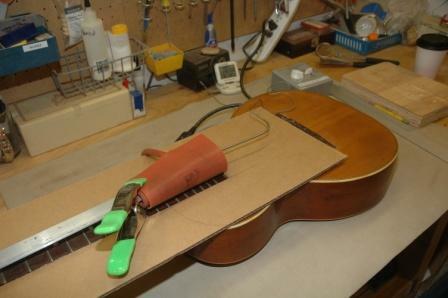 I tried several configurations of a heating blanket on the fretboard to warm it to allow the glue to be softened. Multiple attempts to loosen the glue went naught. Insertion of a spatula under the fretboard went nowhere. I’m concerned the glue is of the ilk that won’t respond to heat to release. I’m tempted to procure another tool, which is specific for heating the fretboard end for loosening. Once the glue is released, I will be able to steam out the dovetail joint and remove the neck. Only then will I be able to determine what needs to be done to remove the depression in the top, and what the new neck angle will be.